It has been seven and a half years since being cured of Parkinson’s. This time has been filled with many blessings as we have grown a worldwide community of people focused on helping each other in the fight to recover from Parkinson’s. I am grateful for all of you. For the last year, I have been writing a book of my journey getting Parkinson’s and living with it, curing myself from it, and what it has been like these last seven years. The book is different from the blog in many ways. In the book I am able to explore the concepts of the disease and recovery at a much deeper level than can be accomplished in the smaller posts contained on the blog. I open my heart and soul and put them on the pages of the book. In Part One of the book, I discuss in great depth what it was like for me in the day-to-day living with Parkinson’s. In Part Two, I go into detail about getting the disease, including the lion I ran from for ten years, and then discuss what I did for my recovery. I moved the physical part of the Recipe to Appendix Two in the back of the book, and I focus on the mind and soul healing. In Part Three, I discuss what these last seven years have been like in my personal life, and with all of you. In Appendix One, I publish my Parkinson’s Daily Journal, which was my daily account of the disease and its impact on me through the first few months of having the disease up to the time I could hardly write anymore and no longer could read my writing. The book is available as a paperback and Kindle e-book, both on Amazon. The paperback is $19.99 (it is 9″x6″ to make it easier to hold, and it is on cream colored paper with a selected font that makes it easier to read). The Kindle e-book is $9.99 (a Kindle reader is a free app for computers, laptops, iPads and other tablets, iPhones, and smart phones). Amazon ranks products by purchases and reviews, so I am asking for your help. I am asking you to please purchase a book, read it, and write a review (Amazon does not require your full name for a review). I have written in the past, “I have the power to heal myself, you have the power to heal yourself, together we have the power to heal the world.” With this book, I am looking to get out the worldwide message that people can, and do, recover from Parkinson’s. As many of you have seen in your own journeys, the non-believers can be unfriendly, so I am anticipating that there will be reviewers who will write poor reviews simply because they do not believe in Parkinson’s recovery. When I ask you to buy a book and write a review, all I am asking for is an honest review. 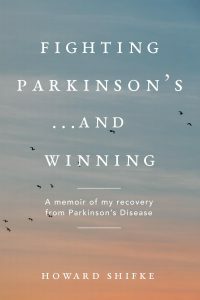 When people with Parkinson’s go to Amazon and are trying to decide if they should purchase the book or not, your reviews will help them know that Parkinson’s recovery is real. That, my friends, is how “Together we have the power to heal the world,” one person at a time. Thank you for your support and for your courage and resilience as you fight Parkinson’s.